Moein, M., Moein, S. (2010). Antioxidant Activities and Phenolic Content of Juniperus excelsa Extract. Iranian Journal of Pharmaceutical Sciences, 6(2), 133-140. Mahmoodreza Moein; Soheila Moein. "Antioxidant Activities and Phenolic Content of Juniperus excelsa Extract". 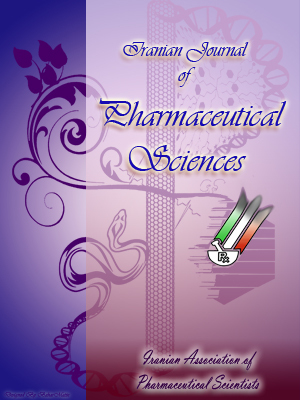 Iranian Journal of Pharmaceutical Sciences, 6, 2, 2010, 133-140. Moein, M., Moein, S. (2010). 'Antioxidant Activities and Phenolic Content of Juniperus excelsa Extract', Iranian Journal of Pharmaceutical Sciences, 6(2), pp. 133-140. Moein, M., Moein, S. Antioxidant Activities and Phenolic Content of Juniperus excelsa Extract. Iranian Journal of Pharmaceutical Sciences, 2010; 6(2): 133-140. 1Department of Pharmacognosy, and Pharmaceutical Sciences Research center, Faculty of Pharmacy, Shiraz University of Medical Sciences, Shiraz 71345, Iran. 2Department of Biochemistry, Faculty of Medicine, and Infectious Disease Research Center, Hormozgan University of Medical Sciences, Bandar Abbas 79149-64153, Iran. Butyl-hydroxytoluene (BHT) is one of the major synthetic antioxidants with a wide range usage. Replacement of artificial antioxidants with natural antioxidants is highly considered. In this research, the antioxidant activity of Juniperus excelsa was investigated by using reducing power, DPPH radical scavenging and inhibition of lipid peroxidation. Also, the amounts of phenolic and flavonoid compounds were determined. Ethanol extract of Juniperus excelsa was fractionated based on increasing the polarity. The reducing power of ethyl acetate fraction was more than butanol fraction. The IC50 of ethyl acetate fraction (204.3±12.8 µg/ml) was less than that of butanolic (>400 µg/ml) fraction (ppJuniperus excelsa, especially ethyl acetate, had more antioxidant activity. Fruits and vegetables in diet significantly reduce the mortality rates of cardiovascular diseases and cancers in human . Many aromatic, spicy and medicinal plants contain antioxidant compounds. However, information about antioxidant properties of various plants that have been used in traditional medicine but are less used presently is not available. Therefore, the evaluation of such properties is attractive, particularly for finding new sources of natural antioxidants . Antioxidant compounds such as polyphenols are common in plants, but high concentrations of these compounds are present particularly in fruits such as apples, grapes, blackberries and strawberries . These compounds possess redical scavenging properties and exert protective effects against cardiovascular diseases . Free radicals can be generated by metabolic pathways in the cell as well as by external sources such as food, drugs, and environmental pollution . Free radicals can cause injury in different tissues and damage macromolecules such as proteins, DNA and lipids. Natural antioxidants such as food complements are used to scavenge or inactivate free radicals. Nowadays, natural antioxidants are attractive subjects, not only for their radical scavenging properties, but also because they have natural sources and are preferred by many people . Thus, in this research, the antioxidant activity of Juniperus excelsa (JE) extract was investigated using different methods. Juniperus excelsa is a member of Conifers which is a small group of the Iranian flora (eight species of 8000 species). All aromatic Iranian conifers belong to the cupressaceae family. In Iran, this family contains Platyclaudus, Cupressus and Juniperus . In other researches, the antioxidant activity of other species of Juniperus, Juniperus virginiana was reported . Table 1. IC50 of Juniperus excelsa extract and its fractions compared with BHT and gallic acid. Figure 1. Reducing power of Juniperus excelsa extract and fractions compared to antioxidant standards (BHT and gallic acid). BHT (Butylated hydroxyl toluene), DPPH (2, 2- Diphenyl-1-picrylhydrazyl), gallic acid, were purchased from Sigma (ST. Louis, MO, USA). All other reagents were purchased from Merck Chem. Co.
Juniperus excelsa (JE) were collected from Genu mountain, north of Bandar Abbas, Hormozgan, Iran. The plant was authenticated by Mr. M. Soltanipour (Natural Resource Research Center, Jahad-e-Keshavarzi, Hormozgan, Bandar Abbas, Iran). A voucher specimen (no. 323) was deposited at the Herbarium of Faculty of Pharmacy, Shiraz University of Medical Sciences, Shiraz, Iran. Nine hundred g of the plant leaves were extracted with ethanol (4.9 L). After drying, the crude extract (110 g) was fractionated based on increasing polarity by n-hexane (3×300 ml), choloroform (3×280 ml), ethyl acetate (3×280 ml) and n-butanol (3×280 ml). The ethyl acetate and n-butanolic fractions which possessed more antioxidant activities were selected for further experiments. The reducing power of the crude extract and fractions were determined by modification of the method described by Yen GC and Duh PD . A series concentrations of JE extract (0.5 ml) was prepared (12.5- 200 µg/ml) in 1.25 ml of 0.2 M phosphate buffer (pH 6.6) containing 1% ferrocyanate (1.25 ml). The mixture was incubated at 50ºC for 20 min. To 2.5 ml of this mixture, 1.25 ml of 10% TCA was added and centrifuged at 3000 g for 10 min. The supernatant was separated and mixed with 1.25 ml of distilled water containing 0.025 ml of ferric chloride 1%. The absorbance of this mixture was measured at 700 nm. The intensity in absorbance could be the measurement of antioxidant activity of the extract . Gallic acid and BHT were used as standards. The DPPH radical scavenging activity was performed according to the procedures described by Bruits et al. . Samples for the experiments (1 mg) were dissolved in 1 ml methanol and further diluted to appropriate concentrations (12.5-400 µg/ml) before being transferred to a 96-well microplate. Controls were prepared with 20 µL methanol and 200 µL DPPH in triplicate. Each well contained 200 µL methanol solution of DPPH (100 mM) and 20 µL of samples. The microplates were incubated at 25°C for 30 min. and the absorbance was measured at 492 nm using a microplate reader (Panasonic KX-P108 athos 2020). Gallic acid and BHT were used as antioxidant standards. The obtained data were used to determine the concentration of the sample required to scavenge 50% of the DPPH free radicals (IC50). The percent inhibition was plotted against the concentrations of extract and the IC50 was obtained from the fitted linear curve. A lower IC50 denotes a more potent antioxidant. The results were expressed as the mean±SD of three replicates (Figure 1). blank sample at =0 min. Table 2. Antioxidant activity of Juniperus excelsa erxtract and fractions, BHT and gallic acid, measured using the BCBTa. Figure 2. Radical (DPPH) scavenging activity of Juniperus excelsa extract and fractions compared to standards BHT and gallic acid (gallic acid is diluted 1:10). Where: “C” is total content of phenolic compounds, mg/g plant extract, in GAE; “c” is the concentration of gallic acid established from the calibration curve, mg/ml; “v” is the volume of extract, ml; “m” is the weight of pure plant methanolic extract . The total flavonoid content of JE subfractions was determined by using colorimetric method. A 0.5 ml aliquot of appropriately diluted sample solution was mixed with 2 ml of distilled water and subsequently with 0.15% NaNO2 solution. After 6 min., 2 ml of 4% NaOH solution was added to the mixture. Immediately, water was added to bring the final volume to 5 ml, then the mixture was thoroughly mixed and allowed to stand for another 15 min. The absorbance of the mixture was determined at 510 nm versus a prepared water blank . Quercetin was used as a standard compound for the quantification of total flavonoid. All values were expressed as mg of quercetin equiv per 1 g of extract. Data was recorded as mean±SD for three replications. The data were analyzed for statistical significance using one way ANOVA followed by Tukey post test. P value less than 0.05 was considered significance. Correlation coefficients (R) to determine the relationship between variables were calculated using MS Excel software (CORREL statistical function). The reducing power of JE extract and its polar fractions as a function of their concentration are shown in Figure 1. The reducing power of the JE extract and polar fractions were increased with concentration. These assays were performed for 12.5 µg/ml to 200 µg/ml of the extract. The reducing power of JE extract and polar fractions were lower than BHT and gallic acid (antioxidant standards). Figure 2 depicts the radical scavenging effects of JE extract butanolic and ethyl acetate fractions in equivalent concentration, and they are compared with BHT and gallic acid as standard radical scavengers. The concentrations in the study were between 12.5 µg/ml to 400 µg/ml. The IC50 of BHT and gallic acid were found to be 68 µg/ml and 2.49 µg/ml, respectively. The IC50 of ethyl acetate fraction is less than BHT and butanolic fraction (Table 1). The contents of total phenolic compounds in JE crude extract, ethyl acetate and butanolic fractlions were 24.8±0.6, 44.5±4.2 and 34.7±2.5 mg/g, respectively. The amount of flavonoids of JE ethyl acetate and butanolic fractions were 0.169±0.005 mg/g and 0.146±0.001 mg/g, respectively. The boiled leaves or fruits of Juniperus excelsa M.-Bieb. subsp. polycarpos combined with animal fixed oil are used for treatment of ear ache in Hormozgan province, south of Iran . In this research, the antioxidant activity of Juniperus excelsa is investigated. There are many methods to determine the antioxidant capacities which differ in terms of their determination principles and experimental conditions . For measuring antioxidant activity, we determined reducing power capacity, free radical scavenging and inhibition of lipid peroxidation. In reducing power, the absorbance of samples at 700 nm will increase due to the conversion of oxidized Fe ІІІ to blue colored Fe ІІ compound. In radical scavenging activity, when DPPH expose to antioxidant compounds, its purple color changes to yellow. The degree of discoloration of DPPH indicates the scavenging potential of the antioxidant extract [15-17]. In methodology, the DPPH method is easy and accurate in measuring the antioxidant activity of fruit and vegetable juices or extract. The results of DPPH scavenging are highly reproducible and similar to other free radical scavenging methods such as ABTS . In bleaching of b-carotene (lipid peroxidation) the yellow color of b-carotene disappears due to the presence free radicals. In other words, in the presence of antioxidant compounds the yellowish color of b-carotene remains constant. It was interesting that the reducing power of ethyl acetate fraction is equal to that of BHT (Figure 1) and more than that of the butanolic fraction (Figure 1). In the present study, the radical scavenging activity of ethyl acetate fraction was more than that of the butanolic fraction and the crude extract p50 of ethyl acetate fraction was less than those of others (Table 1). In other researches, it was also reported that the radical scavenging activity of ethyl acetate fraction was more than that of other fractions . Also ethyl acetate fraction of JE displayed a strong effect in prevention of lipid peroxidation (AAC= 960±20). In other words, this effect of ethyl acetate fraction can be compared with the standard antioxidant compound (BHT), Table 2. This result is similar to other results which showed that the ethyl acetate fraction of Phlomis persica had a remarkable effect in inhibition of lipid peroxidation . Polyphenols are widely distributed in plants and often possess antioxidant activity . Thus in this research, the total phenolic compounds of JE crude extract and fractions were determined (Table 3). The most important antioxidant compounds are phenolics specially flavonoids which are presented in different kinds of plants. These compounds show different chemical and biological properties . It had been reported that the antioxidant activity of plant material is well correlated with the content of their phenolic compounds . The content of phenolic compounds (mg/g) in the methanolic extract of JE and fractions was determined by using regression equation of caliberation curve. The amount of phenolic compounds was expressed in gallic acid equivalents (GAE). The greatest amount of phenolic compounds was found in crude extract of JE (1.7±0.045 mg/g) and the lowest was in the butanolic fraction (0.732±0.04 mg/g). The greatest content of flavonoids is established in ethyl acetate fraction (0.169±0.005 mg/g; Table 3) and the lowest content of flavonoids is in the butanolic fraction (0.146±0.001 mg/g). A low correlation was found between phenolic compounds and radical scavenging activity (R= 0.28). Other researches reported a moderate correlation (R = 0.65) between the DPPH radical scavenging and total phenolic compounds . On the other hand, Gordana et al. was reported a very close correlation between phenolic content and antioxidant activities. The differences of the results showed that the radical scavenging activity of a sample may not predict on the basis of its total phenolic content . The correlation coefficient between flavonoids amounts and radical scavenging activity of JE extracts was 0.604. This result may show that the flavonoid compounds of JE participate in radical scavenging. Acuna UM, Atha DE, Ma J, Nee MH, Kennelly EJ. Antioxidant capacities of ten edible North American plants. Phytother Res 2002; 16: 63-5. Iliauskas G, Venskutonis PR, Van Beek TA. Screening of radical scavenging activity of some medicinal plants and aromatic plant extract. Food Chem 2004; 85: 231-7. Wang Sy, Jiao H. Scavenging capacity of berry crops on superoxide radicals, hydrogen peroxide, hydroxyl radicals, and singlet oxygen. J Agric Food Chem 2000; 48: 5677-84. Hertog MG, Kromhout D, Aravanis C. Flavonoid in take and long-term risk of coronary heart disease and cancer in the seven countries study. Arch Intern Med 1995; 155: 381-6. Hollman PC, Katan MB. Bioavailibility and health effects of dietary flavones in man. Arch Toxicol Suppl 1998; 20: 237-48. McCune ML, Johns T. Antioxidant activity in medicinal plants associated with the symptoms of diabetes mellitus used by the indigenous peoples of the North American boreal forest. J Ethnopharmacol 2002; 82: 197-205. Yen GC, Duh PD. Scavenging effect of methanolic extracts of peanut hulls on free radical and active oxygen species. J Agric Food Chem 1994; 42: 629-32. Bruits M, Asres k, Bucar F. The antioxidant activity of the essential oils of Artemisia Afra, Artemisia byssinica and Juniperus procera. Phytother Res 2001; 15: 103-8. Dapkevicius A, Venskutonis R, Van Beek TA, linssen JPH. Antioxidant activity of extracts obtained by different isolation. J Sci Food Agric 1998; 77: 140-6. Pratt DE. Natural antioxidants of soybeans and other oil seeds, in autooxidation in food and biological systems. New York: Simic MG, Karel M (eds) Plenum, 1980; pp. 283-93. Chevolleau S, Mallet JF, Ucciani E, Gamisans J, Gruber M. Antioxidant activity in leaves of soma Mediterranean plants. J Am Oil Chem Soc 1992; 691: 1269-71. Yanping Z, Yannua A, Dongzhi Wei (2004). Antioxidant activity of a flavonoid rich extract of Hypericum Perforatum L. in vitro. J Agric Food Chem 2004; 52: 5032-9. Soltanipour M. Final report of collection and identification of medicinal plants from Hormozgan province. Deputy of education and research of Jahad-e-Keshvarzi (Iranian Agricultural) Ministry, Tehran, Iran, 1999. Cao G, Prior RL. Comparision of different analytical methods for assessing total antioxidant capacity of human serum. Clin Chem 1998; 44: 1309-15. Siriwardhana S, Shahidi F. Antiradical activity of extracts of almond and its by-products. J Am Oil Chem Soc 2002; 79: 903-8. Moure A, Franco D, Sinerio J, Dominguez H, Nunez MJ, Lema J. Evaluation of extracts from Guevina avellana hulls lema as antioxidants. J Agric Food Chem 2000; 48: 3890-7. Peng C, Lin Z, Lin G. Effects of light on scavenging capacity for organic free radical in leaves of four woody plants. Zhiwu Xuebao 2000;42: 393-8. Gil MI, Tomas-Barberan FA, Hess-Pierce B, Holcrft DM, Kader AAJ. Antioxidant activity of pomegranate juice and its relationship with phenolic composition and processing. J Agric Food Chem 2000; 48: 4581-9. Moein S, Farzami B, Khaghani S, Moein MR, Larijani B. Antioxidant properties and protective effect on cell cytotoxicity of Salvia mirzayani. Pharm Biol 2007; 45: 458-63. Moein S, Farzami B, Khaghani S, Moein MR, Larijani B. Antioxidant Properties and prevention of cell cytotoxicity of Phlomis persica Boiss. Daru 2007; 15: 83-7. Cao G, Sofic E, prior R. Antioxidant and prooxidant behavior of flavonoids: structure-activity relationships. Free Radical Biol Med 1997; 22: 749-60. Moein MR, Moein S, Ahmadizadeh S. Radical scavenging and reducing power of Salvia mirzayanii subfractions. Molecules 2008; 13: 2804-13. Kahkonen MP, Hopia AL, Vuorela HJ, Rauha JP, Pihlaja K, Kujala TS, Heinonen M. Antioxidant activity of plant extracts containing phenolic compounds. J Agric Food Chem 1999; 47: 3954-62. Gordana S, Cetkovic JM, Brunet C, Djilas SM, Tumbas VT, Markov SL, Cvetkovic DD. Antioxidant potential, lipid peroxidation inhibition and antimicrobial activities of Satureja Montana L. subsp. Kitaibelii extracts. Int J Mol Sci 2007;8: 1013-27.